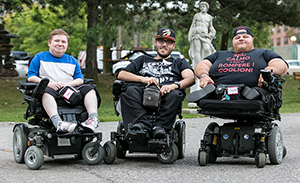 PACE provides personal support services to adults with disabilities. Services are provided on a pre-booked basis. These services are provided between the hours of 6:00 a.m. to midnight, seven-days a week and can be offered in the individual’s home, school or workplace. Have a permanent physical disability and require physical assistance with activities of daily living such as bathing, dressing, transferring and toileting. We provide services to individuals with a variety of disabilities including, but, not limited to multiple slerosis, cerebral palsy, spinal cord injuries, acquired brain injuries, muscular dystrophy and Huntington disease. Be able to direct their own services. This means communicating and training the staff about what you want done, when you want it done and how. Once the assessment process has been completed, eligible applicants are placed on a waiting list until a service provider with available service hours can meet their service requirements. The assessment process takes approximately 1.5 hours. Hours or service are assigned on the basis of need, as determined by the outcome of the assessment. Light housekeeping (this would be cleaning up as part of the regular service for example – after making a meal). Approved applicants are eligible to receive up to 21 hours of personal support/week maximum unless PACE approval has been given. The number of hours of service provided is determined through the assessment.